I don't remember how many times I have seen Good Morning Vietnam, but after seeing it on my home theater in Blu-ray it's like the movie is new again. I do admit it is one of my favorite films so that has something to do with it, but the quality of sight and sound here over my DVD certainly puts the film high on my library shelf. By now most everyone has probably heard or watched Good Morning Vietnam, but for those who haven't here's a little about the film. The movie is based on a real person Adrian Cronauer (played by Robin Williams) who was shipped to Viet Nam during the conflict with the United States over oppression by communist influence to be the radio voice for the troops. Chosen by the post commander because of the comedy in his broadcasting, the soldiers take to him right away; especially because he plays Rock instead of Bach. But, not everyone is happy with the new DJ and Cronauer starts butting heads with the Sergeant Major who thinks that he's way over the top. When Cronauer starts getting too close to the locals, the Sergeant starts looking for a way to get rid of his nuisance. The acting here is extremely good, especially Robin Williams who puts on a very funny show, adds a little drama and sparks some violent happenings. His style of comedy that picks on the little things in the mannerisms of others has always been his mainstay and here he proves to be at the top of his game. His support actors are good and have, since the late 1980's when the film was made, gone on to become known. I'm sure you will be amazed at the young Forest Whittaker (Last King of Scotland), Bruno Kirby (City Slickers) and J.T. Walsh (A Few Good Men) who play Williams' support characters in the film. Direction by Barry Levinson who also gave us Wag The Dog and Rain Man is pinpoint on with the challenges the Vietnam War put on our American fighters without being overbearing on the subject. He treads lightly on the negative aspects and instead brings a little humor and gallantry to our men in uniform that had to fight the damaging conflict. The Blu-ray that's now available has some good bonus features that include at least 15 minutes of on-air comedy called Monologues and a production diary with five features; How The Movie Came To Be, Actor Improv; Music Of The Movie, Origin Of The Good Morning, Vietnam Sign-On, Shooting In Thailand & Overview Of The Film A Year Later. The film has been rated R by the MPAA and contains some disturbing war scenes and adult language. This review was based on the single Blu-ray disc release. 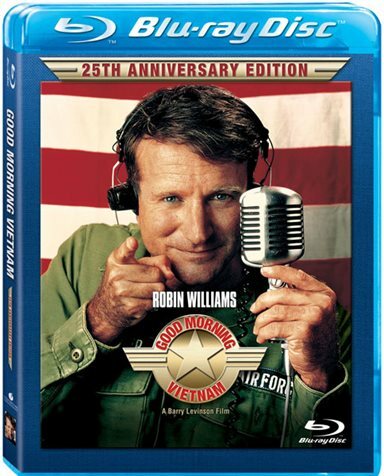 Download Good Morning, Vietnam from the iTunes Store in Digial HD. For more information about Good Morning, Vietnam visit the FlickDirect Movie Database.